He then invites Philip to sit with him. As Luke recounts, “Now the passage of the Scripture that he was reading was this: “Like a sheep he was led to the slaughter and like a lamb before its shearer is silent, so he opens not his mouth. In his humiliation justice was denied him. Who can describe his generation? For his life is taken from the earth”” (8:32-33). The official’s question for Philip relates to the identity of the suffering servant being described in this passage from Isaiah 53. He says, “About whom, I ask you, does the prophet say this, about himself or about someone else?” (8:34). “Beginning with this Scripture,” Philip tells him “the good news about Jesus” (8:35). What follows on this road is that the official is baptized (8:36-38), Philip is carried away by the Spirit to another location (8:39), and then continues preaching the gospel in the area (8:40). This rather minor historical event serves an important role in Luke’s narrative in the book of Acts, caught up as it is in the spread of the gospel by the Spirit across geographic and ethnic boundaries. This brief but fascinating interlude also encapsulates several of the themes of biblical theology and illustrates some of the distinctive goals of the discipline. The official recognizes the need for help in interpretation. There is an emphasis both on the details of an individual passage under investigation but also a broader literary context. The preaching of the gospel is connected to the close reading of the Scriptures. The two opening questions in this account also highlight what is at stake in biblical theology. “Do you understand what you are reading?” and “How can I, unless someone guides me?” are both questions that deserve enduring consideration. There are further questions raised by the details of this scene. What is the message of the Scriptures when considered as a whole? In light of that larger message, how do individual passages relate to that broader textual horizon? In Acts 8, rather than detailing the interpretive decisions Philip makes, Luke chooses to provide a summary of Philip’s comments to the official. However, he does give us a glimpse of his method and show us an outline of the path that Philip takes. “Beginning with this Scripture” (8:35), Philip preaches the gospel about Jesus as the Christ. This interpretive move involves considering the words of the prophet, the words of the gospel, and the ability to connect them. Are the Prophets related to the Gospels? Do the words of the prophet Isaiah really lead to the good news about Jesus? If so, how do they do this? What is Philip on about? These are the types of questions biblical theology seeks to consider. We can begin with a working definition of biblical theology as the study of the whole Bible on its own terms. Having a “working definition” is helpful because one of the major points of discussion in the field of biblical theology is one of definition. A working definition is one that is not necessarily only tentative (not fully formed) but one that is flexible or broad enough for you to work with the definition. A working definition is intentionally brief, easy to understand, and focused on broad essential aspects. These features make it initially useful in orienting you to a particular discussion or type of study. These features also mean that a working definition will need to be unpacked in order to provide definitional clarity. In order to unpack the working definition of biblical theology as the study of the whole Bible on its own terms, we can think about its relationship to exegesis and systematic theology and then note its prevailing concern for the relationship between the Old Testament and the New Testament. The study of biblical theology works within the electrifying dynamic between the two poles of biblical and theological studies. The two main components of biblical theology are of course embedded in the expression biblical theology, making it both a useful and easily misunderstood term. On the one hand, you could take biblical theology to mean a theology that is biblical. Here, the sense of biblical theology is that the reflection one makes about God and all things in relation to God accord with the Scriptures. This refers to a theology that is “sound” or that agrees with what we find in Scripture. As Paul tells Titus, “as for you, teach what accords with sound doctrine” (Titus 2:1). This type of theological correspondence is an important and crucial goal for those who are in ministry. On the other hand, a more specific or narrow understanding of the phrase biblical theology refers more precisely to the theology that is presented in the Scriptures. Here we mean biblical theology to be “the Bible’s theology,” or the “theology that we find in the Bible.” In other words, when doing biblical theology, the goal is to first present the theological reflection that occurs within the Scripture before producing theological reflection that accords with the Scripture. In broad terms, the process of understanding the Bible includes several areas of emphasis. An important preliminary step involves both distinguishing and relating the task of exegesis, biblical theology, and systematic theology. Both biblical theology and systematic theology involve exegetical analysis and also some level of abstraction. Consequently, it is probably not accurate to say one discipline on the whole is “closer” to the biblical text than the other. However, we can nevertheless note the distinctive aims of each discipline. Their purpose, goals, and object of study often are the reason their presentations often seem more or less directly connected to the biblical material. As we will discuss at various points, this does not mean that a given discipline is automatically pursuing a task wholly disconnected from the biblical text. Rather, it could mean that the purpose of a particular study or a presentation of research is more or less suited to an arrangement other than a strict exposition of the biblical text. In our focus on biblical theology, we will be mindful of the way other disciplines relate to our area of study. A working definition of exegesis is the study of an author’s textual intention. 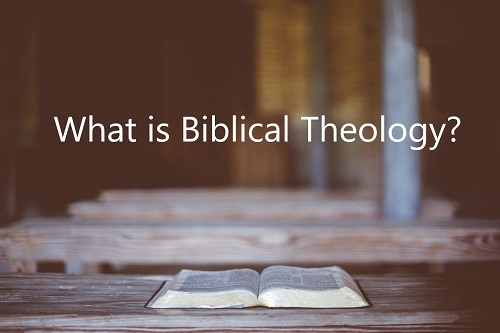 A working definition of biblical theology is the study of the whole Bible on its own terms. A working definition of systematic theology is the study of God and all things in relation to God according to his Word. In some ways, biblical theology shares a family resemblance to close reading of individual biblical texts. Exegesis is the study of an author’s textual intention. Recognizing that the mental state of an author is inaccessible to a reader, the focus of exegesis is on what the author has in fact communicated in a particular act of written communication. The difference between doing exegesis and biblical theology is often a difference of scope. Whereas exegetical studies typically focus on individual passages and ask how individual words relate to other words to form sentences, paragraphs, and sections to create meaning, biblical theology begins asking how those larger sections relate to one another to create book-level meaning. Further, biblical theology begins to ask how the textual intention of one biblical author’s book relates and intersects with books of other biblical authors. Moreover, when one author draws directly upon another biblical author’s text, we can see with clarity how closely the exegetical and biblical-theological tasks are often related within the biblical canon. As the study of God and all things in relation to God according to his Word, systematic theology resonates with the broad sense of biblical theology as a “theology that is biblical” or that accords with the Scriptures. The theological task involves at least three types of activities. First, systematic theology aims to summarize and synthesize what the Bible says about a particular topic in an understandable way. Second, systematic theology seeks to demonstrate the basic coherence and logical connections between the many statements and teachings found in the biblical literature. Third, systematic theology seeks to draw out the theological implications of the statements that the biblical authors make when they compose their texts. Whereas part of systematic theology’s goal is to summarize, synthesize, or draw out the theological implications of what the Bible says, biblical theology is mostly focused on how the Bible says what it says and how the biblical authors have composed their books. Both of these disciplines are critically important and should be constantly related to one another in the context of ministry. They are both important and necessary for the life and practice of the churches. To be sure, each of these tasks are required in order to achieve “the whole counsel of God” (Acts 20:27). Consequently, it is counterproductive to set these tasks against one another in some sort of disciplinary combat. Rather, they complement one another even if the process they move in is not strictly linear. Recognizing its organic connection to exegesis and systematic theology, the focus of the discipline of biblical theology is to articulate and defend the value and significance of the study of the whole Bible on its own terms as a discernible and discrete task. This way of understanding biblical theology strikes at the heart of another definitional question. How do the testaments relate to one another? By defining biblical theology as the study of the whole Bible on its own terms, we necessarily understand the discipline to directly involve grappling with this particular question. How does the Old Testament relate to the New Testament? How do the textual connections between books in these collections impact this area of study? How does the ordering of the canonical collections and the shape and meaning of individual books contribute to the way we address this relationship? If we define biblical theology in the way that we have, these are questions that we should anticipate in this area of study. As we understand the discipline, the aim of biblical theology is to behold the big picture of the biblical writings and to convey the inner-workings of that big picture. How does the big picture of Genesis, for instance, relate to the big picture of the New Testament? Or, how does the book of Romans fit into the meaning of the rest of Paul’s letters? Biblical theology tells a story from “beginning” to “end.” The story of the Bible begins with the creation account in Genesis and ends with the outline of the “last things” in Revelation. These are the bookends of the grand storyline of the Bible. In the beginning, God created the heavens and the earth, and in the end he makes a new heavens and a new earth. This cosmic scope is the staggering perspective that we encounter as we make our way through the biblical narratives. So, when we engage the Scriptures at any level, we must keep in mind the grand storyline that we examine and reflect upon in biblical theology. These preliminary reflections help fill out our working definition. Biblical theology is the study of the whole Bible on its own terms. This discipline of biblical theology can be understood first in relation to the exegetical task and the discipline of systematic theology (a tale of two senses) and also by its relentless pursuit of the question about the relationship between the Old Testament and the New Testament (a tale of two testaments). These distinctives help give shape to this area of study. This working definition and these two areas of emphasis characterize much of the work that flies under the banner of biblical theology. An often-cited discussion of these two senses of “biblical theology” is Gerhard Ebeling, “The Meaning of ‘Biblical Theology,’” The Journal of Theological Studies 6.2 (October 1955): 210-25. Noting that biblical theology is “in any event no simple idea,” Ebeling observes that the term means either “the theology contained in the Bible . . . the theology of the Bible itself” or “theology in accordance with the Bible, scriptural theology” (210). “Both possible meanings,” he laments, “are pregnant with a mass of problems” (210). As Ebeling observes, these two senses represent two distinct disciplines: “In the latter sense, ‘biblical theology’ is a normative concept, in the former sense it is an historical concept. In the one ‘biblical theology’ means a theology of the right kind, in the other a theology of a particular stamp. Among theologians it is the dogmatic theologian who is concerned with one, the historical theologian who is concerned with the other” (210). Thus, Ebeling highlights the importance of reckoning with the issue of definition. For example, Christine Helmer notes that “the famous definition of biblical theology that Gerhard Ebeling formulated in 1955 identified the fundamental ambiguity haunting the field” (“Multivalence in Biblical Theology,” in The Multivalence of Biblical Texts and Theological Meanings, ed. Christine Helmer [Leiden: Brill, 2006], 1). For Helmer, “Ebeling’s contrast has convincingly set the conceptual parameters for biblical theology. The contrast between historical and theological methods, between the object as described historically and the object of theological construction, exposes the braided trajectories of biblical theology’s two foundational disciplines” (2). Brevard S. Childs, Biblical Theology of the Old and New Testaments: Theological Reflection on the Christian Bible (Minneapolis, MN: Fortress Press, 1992), 3. For a helpful dialogue on this particular issue, see D. A. Carson, “Systematic Theology and Biblical Theology,” in New Dictionary of Biblical Theology, ed. T. D. Alexander and Brian S. Rosner (Downers Grove, IL: IVP, 2000), 89-104; and Kevin J. Vanhoozer, “Is the Theology of the New Testament One or Many? Between (the Rock of) Systematic Theology and (the Hard Place of) Historical Occasionalism,” in Reconsidering the Relationship between Biblical and Systematic theology in the New Testament, ed. Benjamin E. Reynolds, et al (Tübingen: Mohr Siebeck, 2014), 17-38. For an articulation of this way of phrasing the definition of systematic theology, see John Webster, “What Makes Theology Theological?” Journal of Analytic Theology 3 (May 2015): 17-28. Webster argues that the object of Christian theology “is twofold: God the Holy Trinity and all other things relative to God” (17). Along these lines, Vanhoozer notes that systematic theology involves “faith seeking understanding—of God, the world and ourselves—through an ordered presentation of the doctrines implicit in the biblical testimony to the history of creation and redemption” (“Systematic Theology,” in New Dictionary of Theology, ed. Martin Davie, et al [Downers Grove: IVP, 2016], 885). Further, this theological reflection is “expressed via contemporary idiom and addressed to relevant cultural intellectual issues” (885). Cf. Michael Horton, The Christian Faith: A Systematic Theology for Pilgrims on the Way (Grand Rapids, MI: Zondervan, 2011), 29: “To assume that the Bible itself gives us a system of doctrine and practice is simply to acknowledge its organic unity as a single canon: the interdependence and coherence of its various teachings.” On the relationship between the disciplines, Horton also notes that “if biblical theology is a topographical map, systematic theology is more like a street map, pointing out the logical connection between various doctrines spread throughout Scripture. Without biblical theology, systematic theology easily surrenders the dynamism of revelation to timeless truths; without systematic theology, biblical theology surrenders the Bible’s internal coherence—the relation of the parts to the whole” (29). Cf. Karl Barth’s understanding of the task of systematic theology (dogmatics) as “the self-examination of the Christian Church in respect of the content of its distinctive talk about God” (Church Dogmatics [London: T&T Clark, 1975], 1.1, 16). In relation to the other disciplines, Barth notes that “exegetical theology investigates biblical teaching as the basis of our talk about God.” Further, “Dogmatics as such does not ask what the apostles and prophets said but what we must say on the basis of the apostles and the prophets” (1.1, 16).